It’s a general rule that I look at fast food promotions and shrug wondering who in the hell wants to eat that stunt. The mere thought of McRibs make me gag, everything at Carl’s Jr. looks like heartburn waiting to happen and I still have no idea what Burger King’s Yumbo sandwich is about. But Popeye’s… I gotta give them credit. They know how to lure me in. Last year, I actively sought out their waffle crusted chicken tenders and although the experience was meh, they did it again and drew me in this year with their Ghost Pepper chicken wings. Only available until the end of January at participating locations, before coated and deep-fried, the wings are marinated in a blend of peppers including the infamous Ghost Peppers. If you don’t know about Ghost Peppers, they’re the super star of hot peppers and I predict that heat is gonna be big this year. In the Scoville rating, jalapenos rate 1,000-4,000 heat unit while ghost peppers can be anywhere from 855,000 to over 2 million units. How’s that for heat?? But back to the wings. Six wing plus a biscuit sets you back $3.99. It also came with a choice of buttermilk dip or black pepper but in preparation for the heat, I opted for the cooling buttermilk to coat the heat as well as my stomach. But one bite in, the wings were anything but spicy. I tossed the dip completely and even let spice-intolerant Paul take a few bites. He agreed that the spice was there although not the scary heat they were advertising. And size-wise, they were tiny. Sad to say that these didn’t live up to the name and the tag “taste the mystery.” If any ghost peppers were used, it appears it was diluted their entire batch for the day or even month. 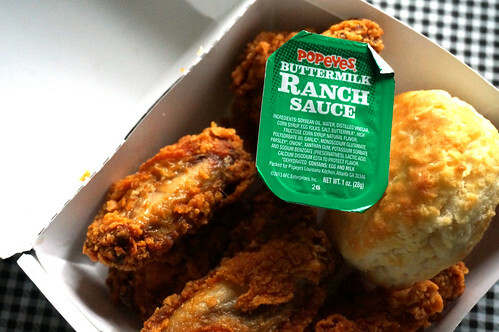 If you’re looking for real heat stick to their spicy chicken. Go in on Tuesday and you can score 2 pieces for less than two bucks. Yuck. Next year when I harvest, I’ll gladly make you some ghost pepper wings…..I think they’ll be spicy enough for you. Yeah. 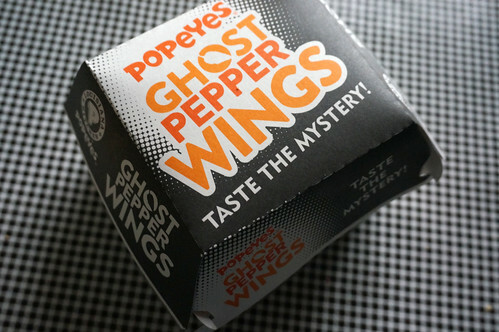 I think they just gave one ghost pepper wing per a franchise. I was wondering that if it was the full heat how they would separate it from the other chicken to avoid cross-contamination of the spice.